Students at a school in Sinjar excited to return to school. “Welcome respected guests.” The words overhead are painted in bright, primary colors. It’s impossible to miss this message, which feels subversive at the entrance to this school in Sinjar, Iraq. Here, in a part of the country where ISIS came to destroy everyone in their path, guests are still welcomed. Below the beam, a class of students squats together in the hallway, ready to go to class. There was just one thing missing. If you have children in school, you are probably used to filling in the gaps to make sure your kids get the kind of education you want for them. Perhaps you chip in extra for school supplies at the beginning of the year. Or maybe you are one of the parents helping their kids sell wrapping paper, cookie dough, magazine subscriptions, chocolate, donuts, or another of the myriad products to pay for new school equipment. There are often gaps between what the school can fund, and the level of service you want for your children. So you help to fill in those gaps. School is a refuge for Venus, age 10. Photo by Hussein Al Agha. Meet Venus. She’s 10-years-old. Venus walks under the brightly painted welcome sign every day as she enters her school in Sinjar. Honestly, she needs all the encouragement she can get. Her father was a police officer, killed by a bomb planted by ISIS. Her family is carrying on the best they can, but life without a father will be difficult as Venus grows up. Getting an education is essential for Venus’ future. If she has an education—if she is literate, and has a diploma that can open the door to future opportunities—she will at least have some options later in life. There was just one thing missing though. Just as you bridge the gaps in the school experience of children in your own communities, you are bridging gaps for Iraqi children, making it possible for them to continue with their education. Venus and her classmates were ready for school, they were excited for the chance to learn after their school was shut down by war, but their school had no money to pay for teachers. That’s what was missing. Teachers. We often talk about the gratitude we have for our monthly donors, those who take their giving and split it up over the course of the year. This is one reason why. Monthly donors allow us to say “yes!” when we get the opportunity to help people who just need a bridge until their community gets back on its feet. Heating fuel allowed 2,000 students to return to school. Photo by Rawand Rasul/Preemptive Love Coalition. 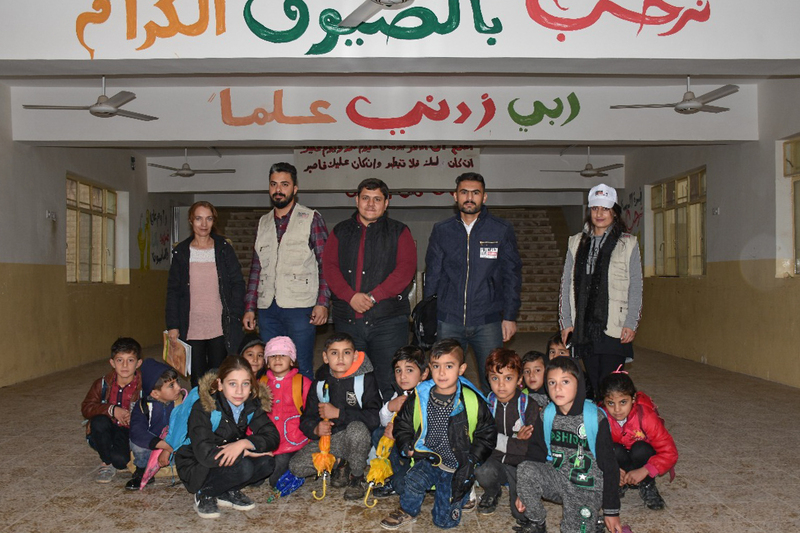 At the beginning of the school year, you provided tanker trucks full of kerosene for a set of three schools in a camp for Syrian families living in Iraq. The schools had funding in place for nearly everything—they had teachers, desks, and stationery supplies. There was just one thing missing. They didn’t have the means to heat the classrooms. Without fuel for classroom heaters, they couldn’t open the schools. Just one small, very important detail could have prevented 2,000 children already living in difficult circumstances from continuing in their education. You stepped in and filled that gap. You allowed four schools to reopen, and thousands of children to access education again. With the delivery of kerosene, three schools for displaced Syrians were opened, and classes began for 2,000 children. For Venus and her schoolmates, pictured above, they were able to resume their studies too. For their teachers, they didn’t have to choose between practicing the vital work they love and feeding their families—they get to have both. More than 2,000 children nearly lost an entire school year because of gaps in funding that didn’t cover teachers and heating fuel. More than 2,000 children nearly fell farther behind their peers around the world growing up in countries free from war. But you stepped up. You helped bridge so students like Venus could take one more step toward a future that war threatened to steal. Give now and help kids reclaim their future. I want to give to	Preemptive Love Coalition.